First thanks to all of you for your comments and encouragement during this crisis. We are holding our own but the days are long and tiring. Yesterday we transported 12 animals to other facilities. Unfortunately we got 17 more in! Wave goodbye and good luck to six of our sea turtles that departed early this morning for the Virginia Aquarium in Virginia Beach. 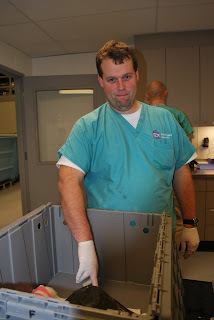 In the photo below, one of our volunteers leaves our facility with six turtles bound for the Virginia Aquarium. 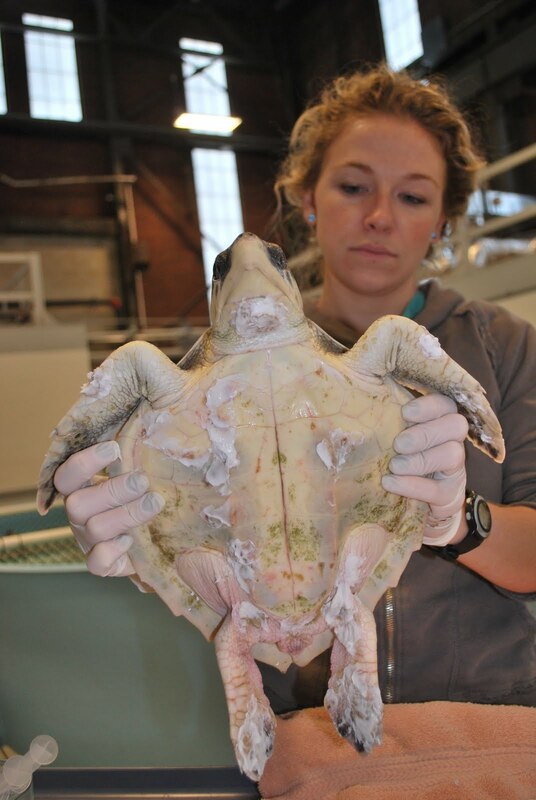 Christina, one of the sea turtle biologists at the Virginia Aquarium stranding program was vacationing in RI. She met our driver and took the six sea turtles back with her. She contacted me last night to let me know that they made the trip just fine and were settled in their new home. The transport needed to happen early (Adam and I arrived at 5:30 AM to prepare the turtles). After our driver, left we started right in with turtle care for the day. In the first photo below Adam reads a thermometer to adjust the swim pool temp for the new turtles. In the bottom photo, our volunteers began arriving and jumped in on treatments. Here Maria cleans a turtle shell. We doubled up for efficiency—look at little number 7, how cute can one little turtle be?! 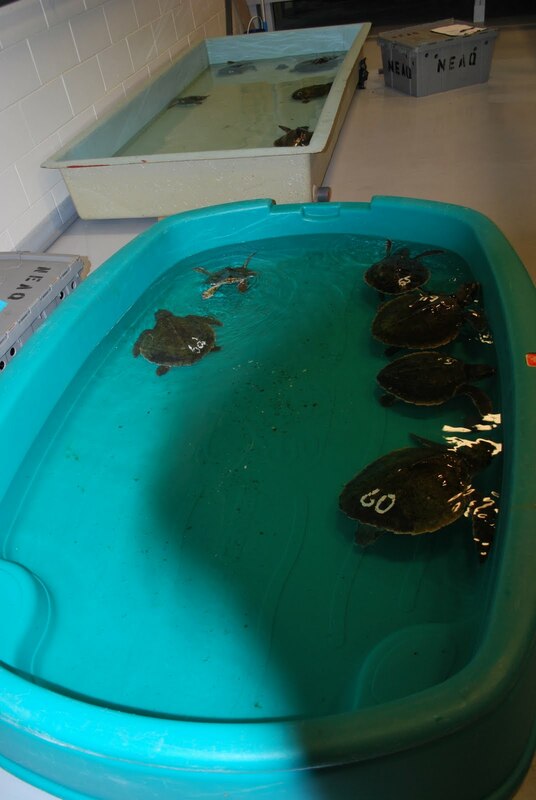 With nearly 80 turtles in house our new clinic is getting a work out and so far is holding up to the test. This is my favorite room of the facility! Below Dr. Innis and Kurt prepare medications for each animal - this takes hours! Below is one of my cases from yesterday. This animal was fresh off the beach and upon first glance looked okay. After examining the ventral region I found a significant wound. 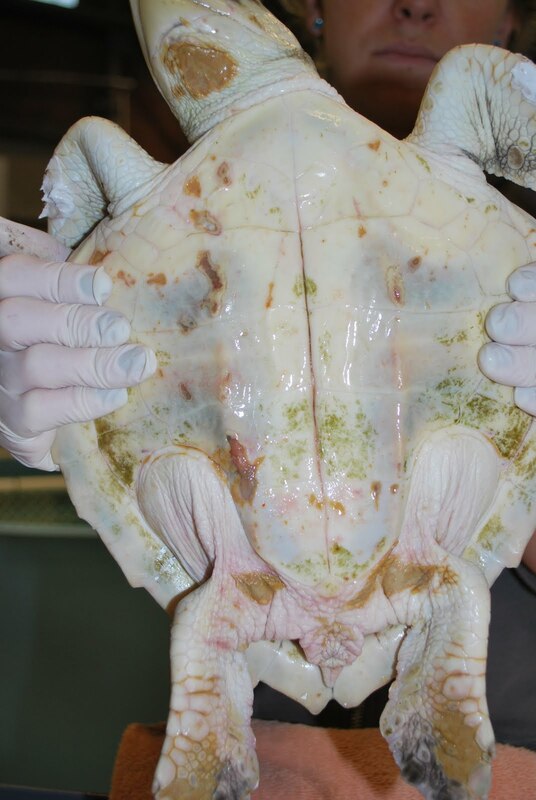 As you can see in the photo on the left the animal's left rear flipper appeared swollen. At closer glance, I could see a soft tissue injury with significant swelling. We will take radiographs of this animal today to be sure there isn't a broken bone involved. At 11:00 AM My colleague, Kristen Patchett, from the University of New England (UNE) arrived to take six animals up to her Marine Animal Hospital at UNE. UNE is a long term partner in marine animal rehabilitation, they always seem to swoop in during the most critical times and lend us a hand - THANKS Kristen and the MARC team!! 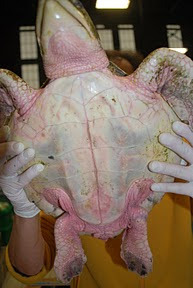 The top photo below shows the turtles packed up and ready to be loaded into the vehicle for the trip to UNE. The bottom photo shows the turtles in the vehicle ready to go. I've dubbed myself supervisor of moral during this crisis situation (Okay, I always assume this role!). I like to run around a couple times a day and check on people. Most important is making sure people are enjoying themselves while saving endangered species. I like to nudge them to make them laugh and keep spirits up! In the photos below newer turtles are supervised as they swim. Several needed assistance and had to be monitored closely so lifeguards were on hand if a rescue was necessary. Here is a photo of the clock on the wall. Adam and I arrived yesterday at 5:30 AM to prepare for the transport and finally left at about 10:45PM. That's a long day of caring for turtles! We have another long day ahead of us but help is arriving daily. Many of our former volunteers are coming back to help out, our field volunteers are pitching in and biologist from other sea turtle institutions start arriving tomorrow. Thanks for tuning in!